Back to Trollhättan. Our walk across the area leads us from the delivery area with its many Volvos in the direction of the former experimental workshop. At the place of longing, where we always hung with tension on the fence and where there was almost every time a little sensation to discover. Parked on the area even today, or finally, interesting vehicles. So there is still development and testing activity on site, which is generally good news. Two sedans in camouflage camouflage attract attention, but are not worth it. Although the two vehicles are, surprise, really Saabs. But camouflaged model year 2014 turbo petrol engine. More exciting are the two unguarded limousines. These are NEVS 9-3 electric cars, which probably correspond to the model year 2019. The first ones we see in Europe. 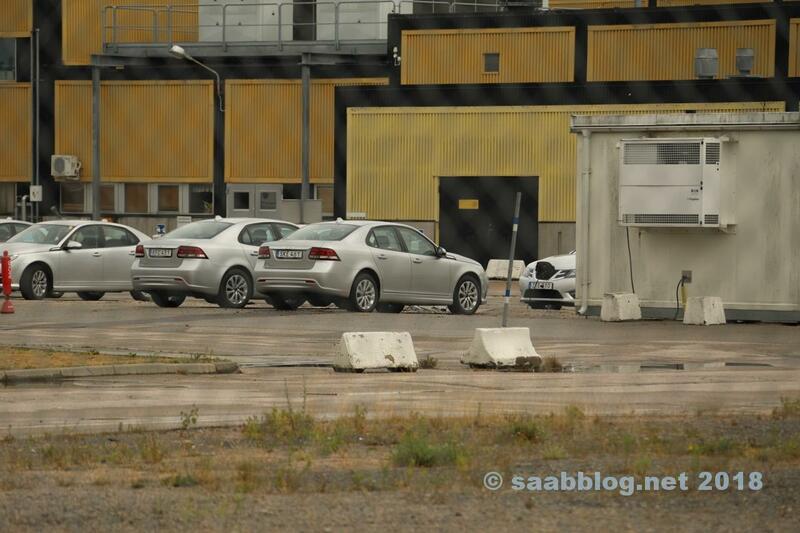 The tail is, except for small changes, still strongly based on the Saab sedan. A more dominant chrome strip with the NEVS logo, a few small retouches, the unchanged 9-3 logo on the bottom left. Changed the door handles, now with chrome inserts, the exterior mirrors have a new design and an additional LED indicator. The bonnet is higher, as it was already seen on press pictures. To the right of the two sedans another NEVS 9-3 electric car is parked. The frontend seems identical to the Saab Griffin design of model year 2011 1 / 2, except for the grille inserts and LED daytime running lights. Anyone who wonders where the NEVS electric cars hide their charging options, today discovers the answer. Where once the proud Saab lettering was, hides in the style of a Nissan Leaf the flap for the current consumption. Disguised 9-3. Exciting? No, a turbo gasoline engine MY 2014. What do we know about the NEVS 9-3 EV? In principle, virtually nothing. The photographed vehicles are from the year 2018. They are powerful 130 KW and, unusually for an electric vehicle, have a conventional automatic transmission. In Sweden they are registered as pre-production vehicles for testing, the highest known VIN number is the 00026. Probably they belong to the small series, which by hand in the Frickeboa were mounted. From autumn / winter 2018, the NEVS 9-3 EV will be built in series in this form in Tianjin. But that is not certain, financing issues should still be unclear. Export to Europe is unlikely, as is production in Sweden. The work was largely dismantled, it is only an empty shell. 17 thoughts too "NEVS 9-3 EV model year 2019"
As long as there are still some employees who get their salary it is still positive. But the whole story is not. I do not think that NEVS can start at all. But miracles have not left our world yet so we wait. It is at least another story Tom has brought us. Thanks for that. I would like to know how many employees (China and Sweden) are currently employed by NEVS - hundreds of specialists were already acquired several years ago. If the whole thing should work out in China, the later completion and modernization of the plant in Trollhättan could possibly be accomplished. Eco-friendly vehicles of good quality are becoming increasingly important in Europe too. Unfortunately, European manufacturers continue to bring their fuel-guzzlers and mud-throats primarily to the people. The cause is of course incompetent politicians and consumers - a wider range of usable electric vehicles would be desirable and the government should finally move the focus on electric mobility - not even in the company car, most political leaders can be separated from their sling! Current figures are not available. And please keep the manners! You can also give his opinion a little nicer, so far that always worked perfectly. Thank you! Thank you for the interesting update. Where exactly was this fabled "Experimental Section" on the site? In which direction, if one imagines in front of the "entrance portal" (porter's lodge)? Incidentally, I can not find any real lapses in Detlef Rudolf's contribution. Anyone who likes to cycle or walk on ecological or fitness grounds simply can not find another expression for these stinkers in everyday traffic. I too am annoyed every day about this "DS" n. Why does an e-Golf in Norway cost less than its incinerator and here in Germany one reads that diesel sales suddenly pick up again, because customers do not want to give up their sufffs. In any case, as long as ORIO has spare parts for our Saabs, I will not spend a cent on a new car with DinoTechnik. Northern driveway, just after the gym. Behind the gym was a running track into the forest and lit in the dark. It comes very close to the fence of the experimental workshop. There one could, if one had fought something through botany, win the best impressions. Today, the site is also shared by external service providers. It is not really exciting anymore. Detlef Rudolf has only written the truth what everyone else thinks. I personally would buy a NEVS. I would definitely not. My confidence in NEVS is less than zero. In any case, electrified plugs are more environmentally friendly than batteries. At the latest when the cars drive autonomously and are only rental objects of mobility service providers, I could just as well put in a train or a bus with overhead contact line and cover the last 100m by foot. A bulk purchase would then have to be in the wagon. If it saved the world, why not? Even with new cars, there are still the ghosts! If that's all NEVS has developed over the years, then maybe they should pull the ripcord as fast as possible, that's just money-burning. Do they really still believe that they will ever get the money back? Most automakers are churning tens of millions of research funds into alternative drives, where should NEVS get capital from in the future? These classic looking 9-3s are probably for the chinese market. We have to wait and see what they will offer for us! On display are "a handful" of NEVS 9-3 EV, probably from the pre-series, built by hand, Tom reports. Whether, when and where they are then mass-produced ..., that only Chinese people know. That would be the positive part of the story so far. Thanks to the editors 😉 for the status report from Trollhättan! I can only sign the comment by Herbert Hürsch. sustainable for the environment and for the minerals extracted from the earth. old and still active for short and long journeys. First of all, many thanks to the team for the report. Unfortunately, the subject of e-mobility for me is just a continuation of the scrapping premium. It is driven by politics every 2-4 years a new pig through the village to boost the economy. What was good yesterday is catastrophic today? With these statements, politicians question their own statements. What about the production of batteries and their components with environmental protection? Where and how are these components broken down? How are they disposed of? What about the vehicles that make the lifetime of the batteries after a few years to the total economic loss? Who buys an 10 year old used E-car with more than 100000km on the clock? What does all this have to do with environmental protection? These and other questions are not answered and in my opinion they will not. The topic is a political issue. But never uniform. And what does majority mean? History has many examples ready that even majorities may have gotten lost. Or for the fact that majorities can change. For example in the light of new findings. … A VERY GOOD IDEA ! ! ! They should just disappear with the things to China and not in Europe with this caricature of a SAAB! I do not like electric cars anyway because they are ecological and economic madness and brain tears but especially in the dress of a great car like the SAAB 9-3 I find the power drive even more to vomit! If the 9-3 already necessarily serve as a basis then it should NEVS but visually please change so that you do not recognize that the end product even remotely has something to do with SAAB! It is good that these things are not allowed to carry the name SAAB and that SAAB does not have to endorse and participate in the electronic waste trend. Enter your e-mail address to get this blog to subscribe and receive notifications of new posts via email. Saab 9000 CC - where are the survivors? Copyright © 2011 - 2019 SaabBlog.net, All rights reserved.